Background: Magnetic resonance imaging (MRI) is increasingly used to detect inflammation in the spine of patients with ankylosing spondylitis (AS). Objectives: To detect differentially the presence and extent of inflammation in the three spinal segments of patients with AS by MRI. Methods: In 38 patients with active AS, acute spinal lesions were assessed by T1 weighted, gadolinium enhanced, spin echo MRI (T1/Gd-DTPA) and short τ inversion recovery (STIR) sequences. MRI was quantified by the validated scoring system ASspiMRI-a. Acute spinal lesions were detected in the whole spine and in each spinal segment. One vertebral unit (VU) was defined as the region between two virtual lines drawn through the middle of each vertebral body. Results: A greater number of inflammatory spinal lesions were found by the STIR sequence than by Gd-DTPA: inflammation was present in 30.6% of the VUs as assessed by STIR, compared with 26.8% of the same VUs assessed by T1/Gd-DTPA. Inflammation was found more commonly in the thoracic spine (TS) than in the cervical (CS) or the lumbar spine (LS) with both techniques. When STIR was used, spinal inflammation in the CS, the TS, and LS was detected in 10/38 (26%), 28/38 (74%), and 9/38 (24%) patients, respectively. The VU T7/8 was found to be the VU most often affected by both techniques (27.8% by T1/Gd-DTPA and 34.5% by STIR). Conclusions: Spinal inflammation is a common manifestation in patients with AS, and appears more frequently in the TS. The scoring system ASspiMRI-a can be used for evaluation of acute spinal changes in AS. The thoracic spine is difficult to visualise by conventional radiography, so scoring of acute and chronic spinal lesions in this region is not part of established radiological scoring systems, which assess only the lumbar and cervical spine. Therefore, our knowledge about the presence of acute and chronic spinal lesions in the thoracic spine has been rather limited to date. The differential involvement of spinal segments by inflammation has not been systematically analysed until now. The main aim of this study was to assess the presence and extent of inflammation in all three spinal segments in patients with AS by T1 weighted, fat saturated, post-Gd-DTPA and STIR MRI sequences, and to compare the differential involvement of the three spinal segments. The 38 patients with AS examined had been referred to the university outpatient clinic because of back pain due to AS. Some patients were candidates for inclusion in the large randomised controlled trial on the efficacy of infliximab in AS performed in Germany.5 All had been conventionally treated with non-steroidal anti-inflammatory drugs before inclusion in this study. None of them had ever been treated with biological agents. Of the 38 patients, 24 (63%) were male. 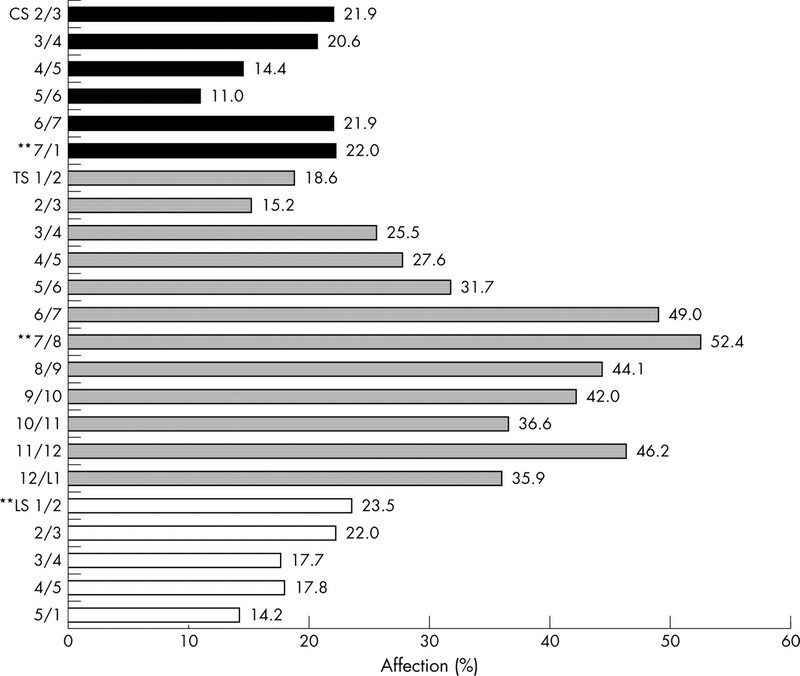 The mean age of the patients was 40.9 years (range 32–54); 35 (92%) were HLA-B27 positive. The mean (SD) erythrocyte sedimentation rate was 31.2 (23.0) mm/1st h and the mean (SD) C reactive protein was 22.2 (21.9) mg/l. The patients had active disease with a mean (SD) Bath AS Disease Activity Index (BASDAI) of 6.4 (1.4) and Bath AS Functional Index (BASFI) of 5.5 (2.1) (table 1). Before the study, the diagnosis AS was confirmed by radiological examination of the sacroiliac joints in all patients. The same sequence with fat saturation after application of Gd-DTPA (Schering AG, Berlin, Germany) at 0.1 mmol/kg body weight. No dynamic imaging was performed. C2 and L5 were taken as orientation points and the spine was examined in two parts, always starting with the upper part. After rapid adjustment of the table into the appropriate position the lower part of the spine was examined. Similarly, STIR sequences (repetition time/inversion time/echo time 4000/150/60 ms, slice thickness 3–4 mm, one acquisition) with intrinsic fat saturation were performed. T2 weighted images were also available and were taken into account when differentiation between chronic and acute lesions was doubtful. The MR images were blinded for patient identity and were then chosen by an independent person. Evaluation was performed by two readers (JB, WG), by evaluating each time first the T1/Gd-DTPA and then the STIR MR images of one patient in each reading session. Each evaluation was performed twice by each reader (at different times). Thus, each image was evaluated four times in total. The new scoring system ASspiMRI-a for evaluation of acute spinal lesions in patients with ankylosing spondylitis as assessed by Gd-DTPA and STIR MRI. The ASspiMRI-a scoring system in detail. Grades 1–3 indicate only erosion with differentiation of the range of inflammation (in the Gd-DTPA sequence) or oedema (in the STIR sequence). 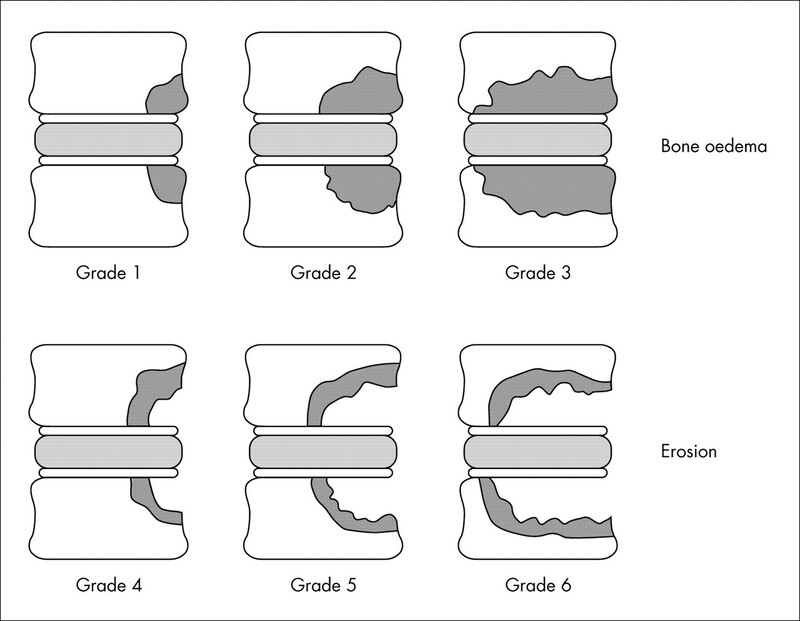 Grades 4–6 indicates inflammation with erosion, in relation to the extent of the erosion in the assessed VU. Spinal involvement due to AS was assessed by using the lateral view of the spine and evaluating spinal changes on the basis of vertebral units (VUs). 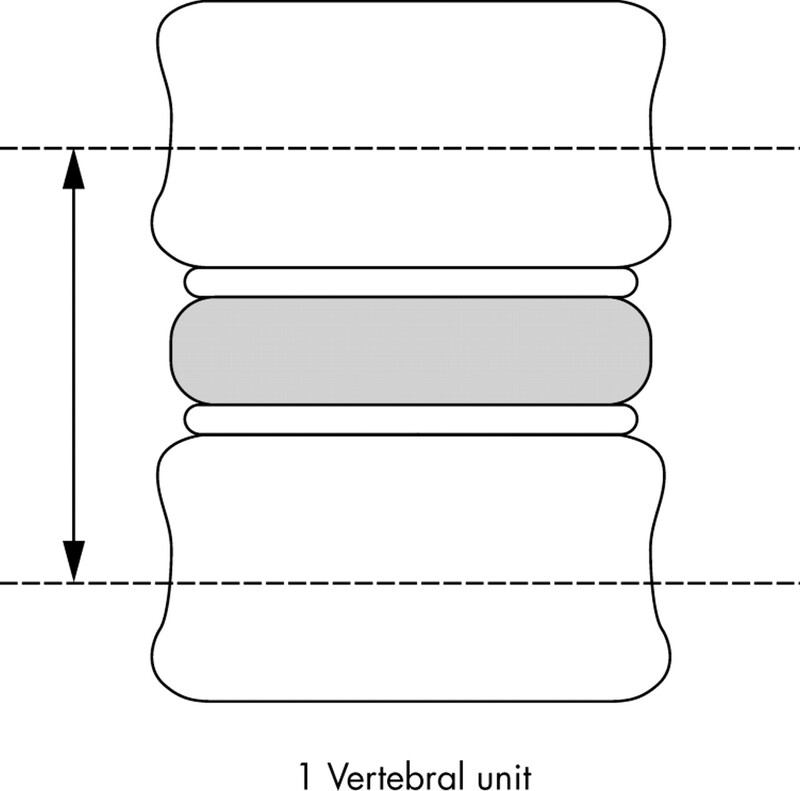 One VU is defined as the region between two virtual lines drawn through the middle of a vertebral body (fig 310). Definition of the VU for using the ASspiMRI score in the evaluation of MR images in the spine of patients with AS. Overall, 23 VUs from C2 to S1 were assessed by the ASspiMRI-a (6 VUs in the cervical spine (CS) from C2/3 to C7/T1; 12 VUs in the thoracic spine (TS) from T1/2 to T12/L1, and 5 VUs in the lumbar spine (LS) from L1/2 to L5/S1). Acute spinal changes are graded by the ASspiMRI-a in a range between 0 and 6 (fig 1). Definite involvement of a VU in the evaluation of both MRI sequences indicates inflammation/oedema with and without erosion and it is defined as a VU score >0 in the ASspiMRI-a. The extent of inflammatory spinal disease due to AS was analysed by comparing the same VU in each of the two MRI sequences and by calculating these results on the basis of four different aspects: (a) the mean score of the four readings for each single VU; (b) the inflammation seen in each VU (affection by the disease or not); (c) the involvement of each spinal segment; and (d) the analysis of each individual patient. Spinal activity was analysed for a single VU, for a spinal segment, on for the spine, and for a single patient, for each MRI sequence. Comparisons between the T1/Gd-DTPA and STIR sequence scores were performed by first calculating the means of the four readings for each VU for each sequence and then by comparing similar VUs for each sequence. Statistical comparison of the scores in the two MRI sequences was performed by the Wilcoxon test. For the assessment of inflammation at the patient-level, both readers had to score positive findings in the same patient for confirmation of inflammation. VUs with scores “1” to “6” were considered positive for inflammation, whereas VUs with a score “0” were considered negative for inflammation. Proportions of affected VUs for each sequence (STIR, post-Gd-DTPA) in the same patients were compared by the McNemar test. Spinal inflammation was most frequently found in the TS (mean score 0.69 and 0.74 per VU for T1/Gd-DTPA and STIR sequences. The other two segments were less frequently affected (mean score 0.24 and 0.28 in the CS and 0.41 and 0.34 in the LS for T1/Gd-DTPA and STIR, respectively). Table 2 shows the means and standard deviations (SD). The VUs which were found to be most commonly affected by inflammation were the same by both MRI techniques. As assessed by STIR, it was the VU C7/T1 in the CS (26.2%), in the TS it was the VU T7/8 (53.7%—this was also the VU most commonly affected in the whole spine (fig 6)—and in the LS it was the VU L1/2 (27.1%). Figures 4 and 5 show the numbers and proportions of all VUs, as assessed by both MRI techniques. Relative involvement of each single VU in the assessment of inflammation by the Gd-DTPA MRI sequence and evaluation with the ASspiMRI-a scoring system. Values are shown as percentage of VU affected. **VU most commonly affected in each spinal segment. Relative involvement of each single VU in the assessment of inflammation by the STIR MRI sequence and evaluation with the ASspiMRI-a scoring system. Values are shown as percentage of VU affected. **VU most commonly affected in each spinal segment. 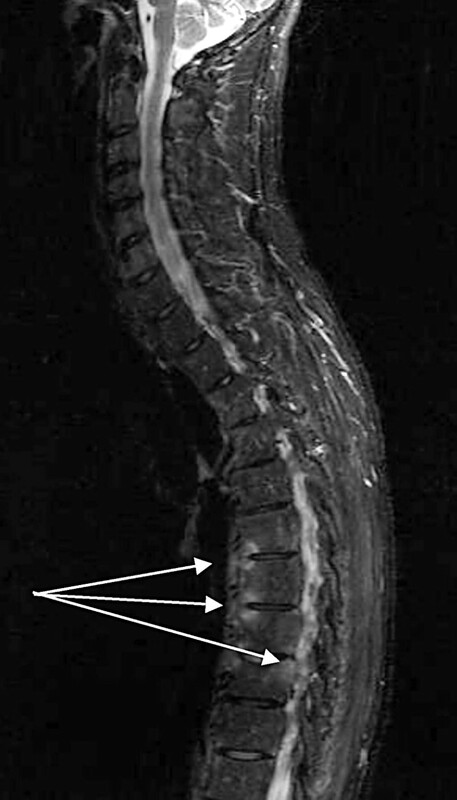 Spondylitis anterior in T6/7 and T7/8 and spondylitis posterior in T8/9 as seen in the STIR MRI sequence. Inflammation is seen as a spot in the vertebra (arrows). Definite inflammatory involvement of each spinal segment was found in 16% of the VUs of the CS by T1/Gd-DTPA sequences and in 20.7% by STIR sequences, respectively (p<0.05). In the TS, 34.5% and 38.7% of the VUs (p<0.001) and in the LS 20.3% and 23% (p<0.05) of the VUs showed definite inflammation in the T1/Gd-DTPA and STIR sequences, respectively. In the whole spine, definite inflammation was found in 26.8% of the VUs in the evaluation of the T1/Gd-DTPA sequence and in 30.6% in the evaluation of the STIR sequence (p = 0.001). When analysing each patient individually, evaluation of the T1/Gd-DTPA sequences showed that 9/38 (24%) patients with AS had definite spinal inflammation in the CS, 28/38 (74%) in the TS, and 7/38 (18%) in the LS. 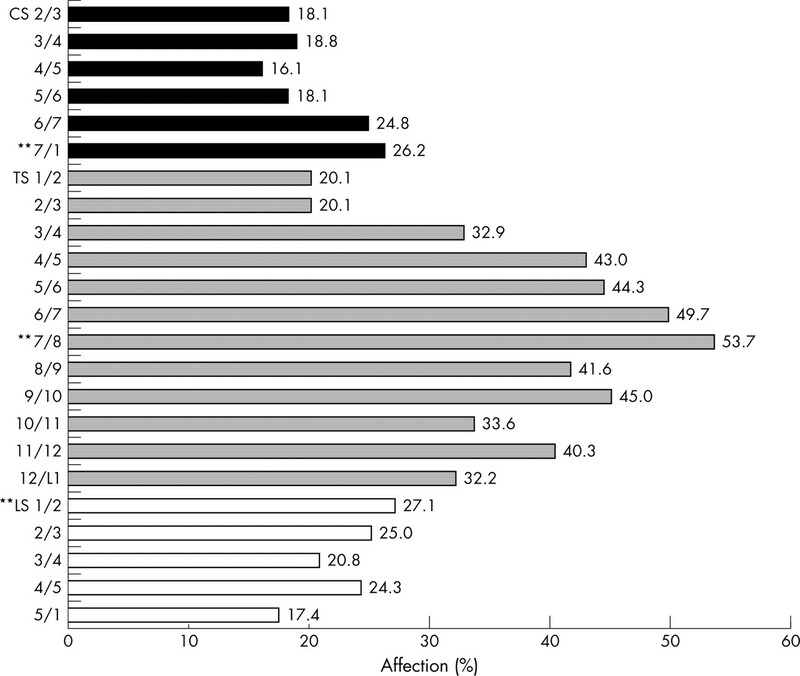 Evaluation by STIR sequence showed definite inflammatory involvement in 10/38 (26%), 28/38 (74%), and 9/38 (24%) patients for the CS, TS and LS, respectively. This study shows that inflammation is a prevalent feature in AS, which can be assessed by MRI techniques such as T1/Gd-DTPA and STIR. The scores of both magnetic resonance sequences confirm that the TS is more commonly affected by inflammation in AS than the other two spinal segments. This important finding is substantiated by the results of the analyses of the different levels assessed: a single VU, a spinal segment, and an individual patient. The subanalysis of definite involvement provides conservative but solid data on active spinal inflammation in AS. Indeed, as the more detailed analyses showed, the spinal region most commonly affected by inflammatory involvement in AS was the region between the middle part of the TS (T7/8) and the middle part of the LS (L2/3). This information is important for the question of which spinal region should be the main site of imaging in patients with AS in daily practice or in clinical studies. On the basis of this evidence, we suggest that at least the lower part of the TS and the LS should be included in MRI examinations in patients with active AS. There is increasing interest in the assessment of disease activity and spinal inflammation by MRI because of the successful use of biological agents in AS, especially infliximab5,9 and etanercept.7,8 Furthermore, T1 weighted post-contrast agent and STIR MRI techniques are being increasingly used to detect active spinal lesions in AS, especially in clinical trials, in order to evaluate whether inflammation “visibly” improves after treatment with anti-tumour necrosis factor agents. Taken together, the ability of MRI to detect acute spinal changes may be a major step forward in imaging inflammation in AS. The TS is most commonly affected in AS. Such states can be assessed both by STIR and by T1 weighted, contrast agent enhanced MRI. Calin A, Porta J, Fries JF, Schurman DJ. Clinical history as a screening test for ankylosing spondylitis. JAMA1977;237:2613–14. Braun J, Bollow M, Sieper J. Radiologic diagnosis and pathology of the spondyloarthropathies. Rheum Dis Clin North Am1998;24:697–735. Davis JC Jr, van der Heijde D, Braun J, Dougados M, Cush J, Clegg DO, et al. Recombinant human tumor necrosis factor receptor (etanercept) for treating ankylosing spondylitis: a randomized, controlled trial. Arthritis Rheum2003;48:3230–6. Braun J, Brandt J, Listing J, Zink A, Alten R, Burmester G, et al. Two-year maintenance of efficacy and safety of infliximab in the treatment of ankylosing spondylitis. Ann Rheum Dis2005;64:229–34. Baraliakos X, Golder W, Brandt J, Rudwaleit M, Listing J, Sieper J, et al. Analysing acute spinal changes in ankylosing spondylitis – a systematic comparison of conventional x-rays with magnetic resonance imaging (MRI) using established and new scoring systems. Orlando, FL, USA: in 67th Annual Scientific Meeting of the American College of Rheumatology, 2003. Braun J, Baraliakos X, Golder W, Hermann K-G, Listing J, Brandt J, et al. Analysing chronic spinal changes in ankylosing spondylitis: a systematic comparison of conventional x rays with magnetic resonance imaging using established and new scoring systems. Ann Rheum Dis2004;631046–55, doi:10.1136/ard.2003.019968 [published Online First 5 April 2004]. Baraliakos X, Hermann KG, Landewe R, Listing J, Golder W, Brandt J, et al. Assessment of acute spinal inflammation in patients with ankylosing spondylitis by magnetic resonance imaging (MRI) - a comparison between contrast enhanced T1 and short-tau inversion recovery (STIR) sequences. Ann Rheum Dis. Published Online First 13 January 2005. doi:10.1136/ard.2004.031609. Melton LJ 3rd, Kan SH, Frye MA, Wahner HW, O’Fallon WM, Riggs BL. pidemiology of vertebral fractures in women. Am J Epidemiol1989;129:1000–11. Frei H, Oxland TR, Nolte LP. Thoracolumbar spine mechanics contrasted under compression and shear loading. J Orthop Res2002;20:1333–8. Harrison DE, Colloca CJ, Harrison DD, Janik TJ, Haas JW, Keller TS. Anterior thoracic posture increases thoracolumbar disc loading. Eur Spine J. 2004 May 27; [Epub ahead of print].